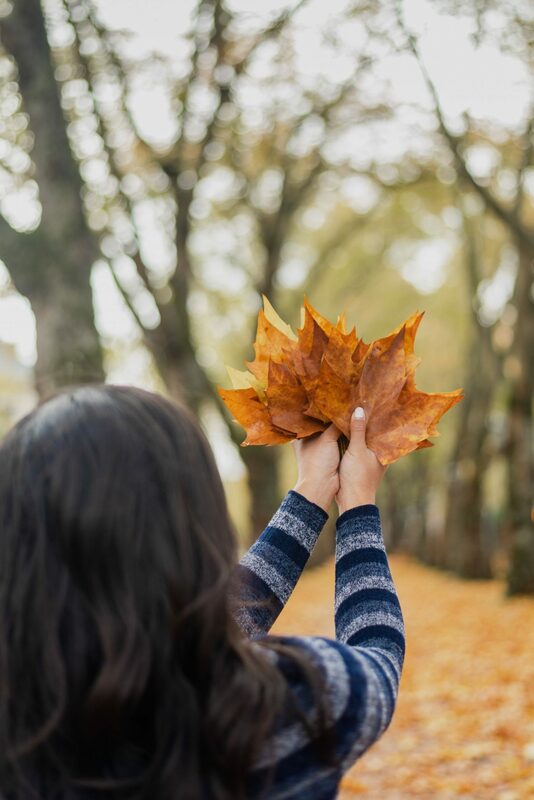 Whether you love the leaves, the pumpkin spice lattes, or the pumpkin patch, there are so many reasons to love fall. 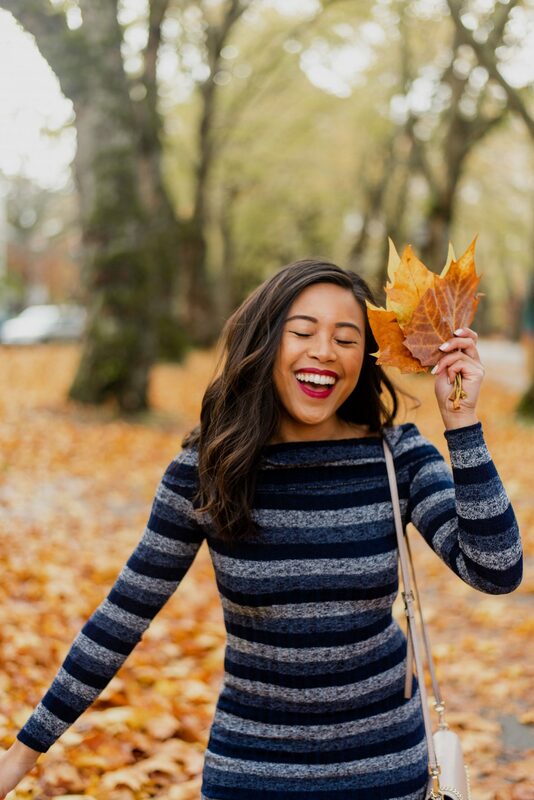 Fall in the Northwest is a beautiful time – both the scenery and the fashion landscape transform with the cooler temperatures and shorter days. Personally, I trade my crop tops and summer dresses for sweater dresses and hats! 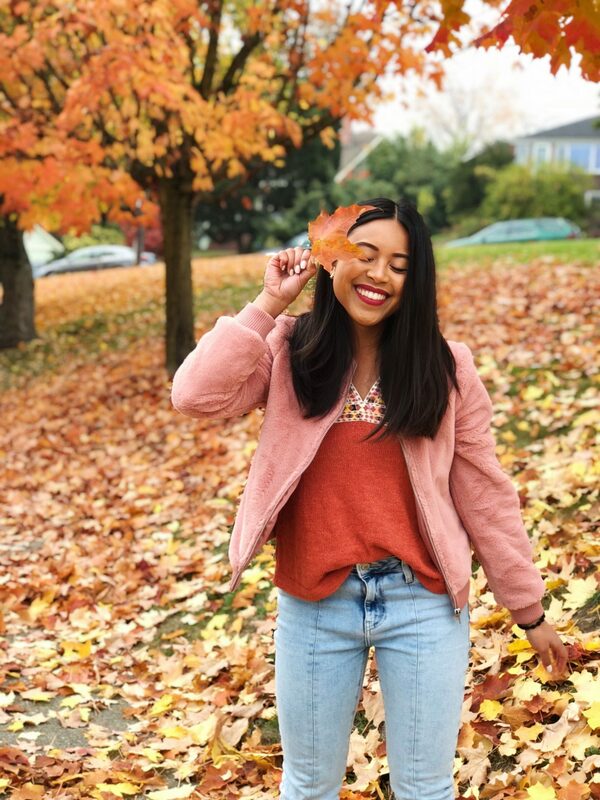 So today I wanted to pull together some of my favorite fall outfits this season. 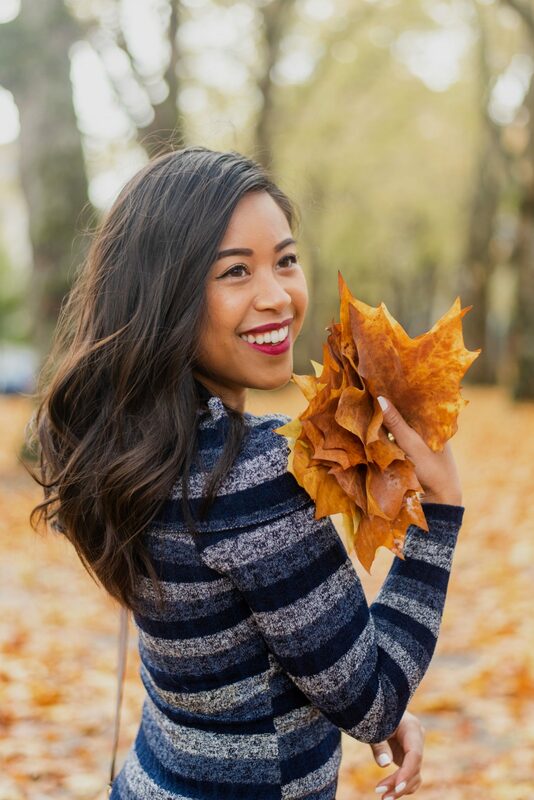 If you’re looking for fall style inspiration, this blog post is for you! I personally love pairing staple pieces with trendier pieces. So this season I styled this striped sweater dress with pointed combat boots. I first started seeing a resurgence of the combat boots during New York Fashion Week. I personally have worn combat boots on and off since freshman year of college so I was excited to see such a wearable boot walking around fashion week. I opted for a pointed combat boot vs. a round toe combat boot because I don’t have any boots like this! Pageboy hats were everywhere last fall and winter season – and they’re back! I personally picked up this pageboy hat at the end of winter last year. I thought it would be fun to style a pageboy hat with an oversized, overwhelmingly cozy turtleneck sweater dress! 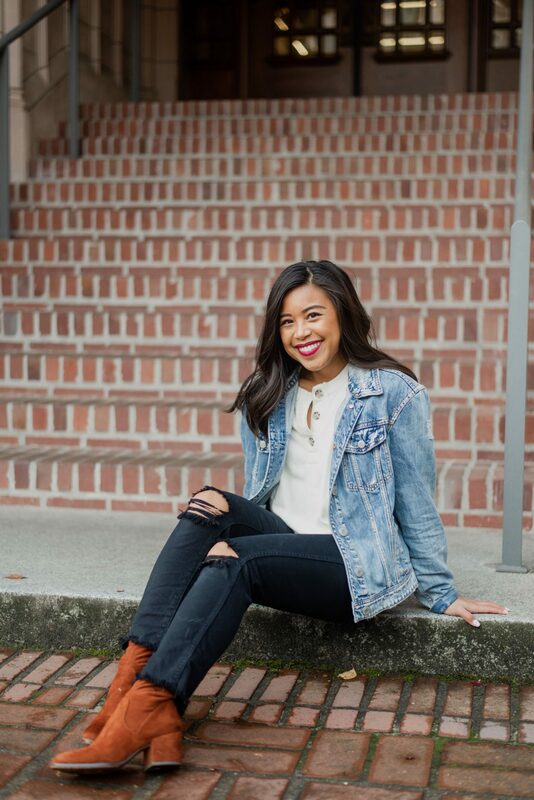 Did you know that this denim jacket and cropped black jeans are two staple pieces in my closet? 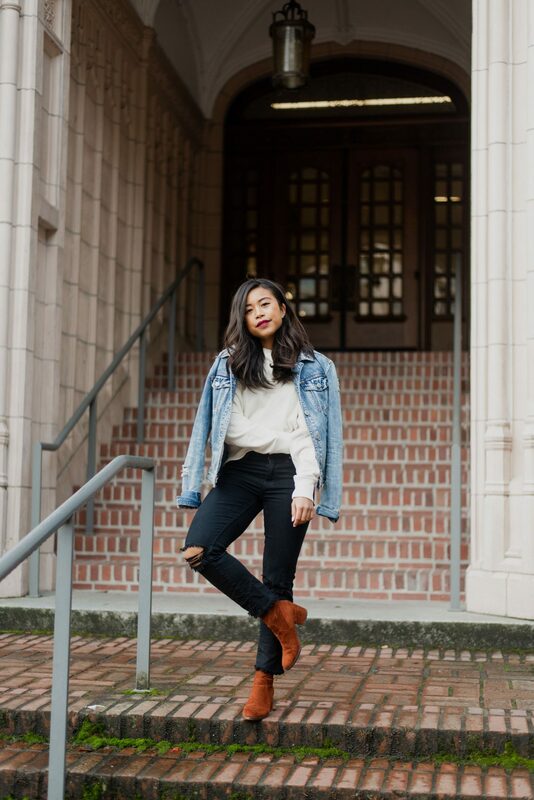 I first featured these cropped black jeans on my first trip to New York Fashion Week and this denim jacket over two years ago in a spring look. And I could literally wear all these pieces over and over again. 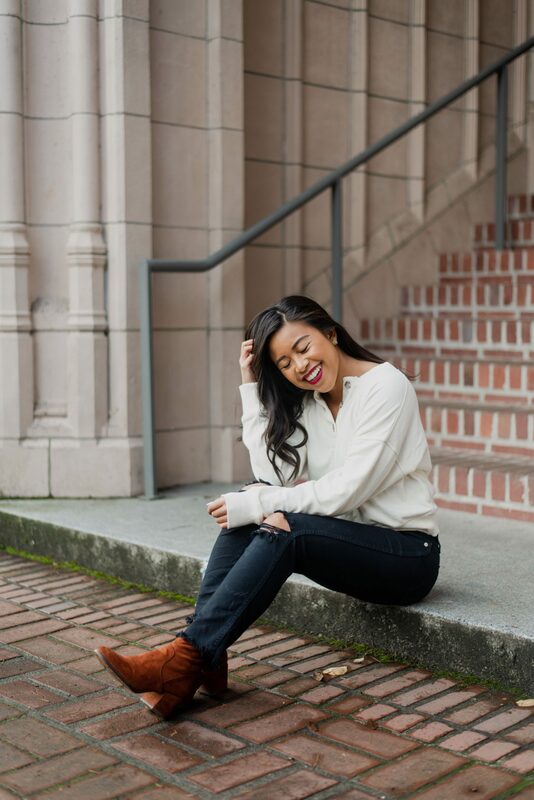 For a fall outfit, I styled this college- inspired look (I actually wore this to class the other day) with a pair of orange suede boots and a comfortable pullover Henley sweater. 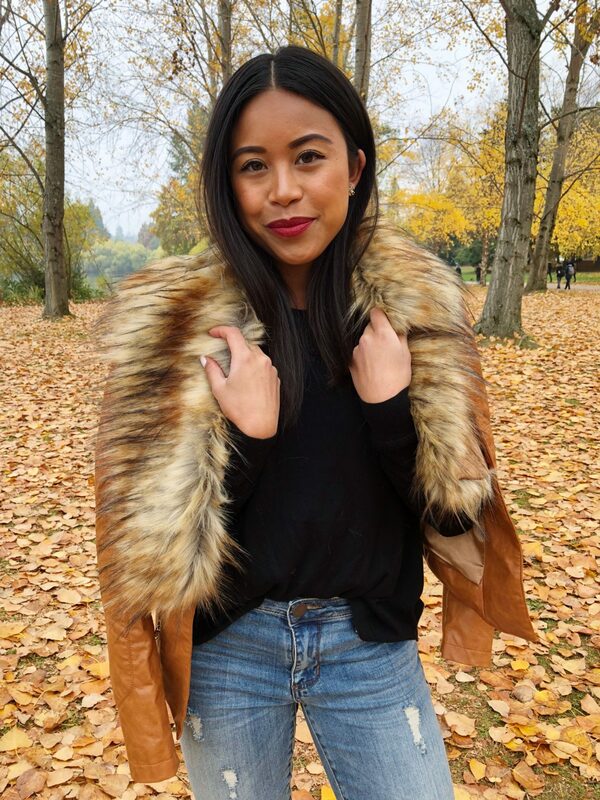 This faux fur jacket came in my last Stitch Fix box and I’m obsessed. I don’t think I’ve ever owned a faux fur coat like this before but honestly I love it because it’s such a statement coat. Because I built this outfit around the faux fur coat, I styled it with a simple black sweater, skinny jeans, and my brown booties. Sometimes I like to challenge fall’s traditional colors of orange, brown, burgundy, and red with a pop of pink! 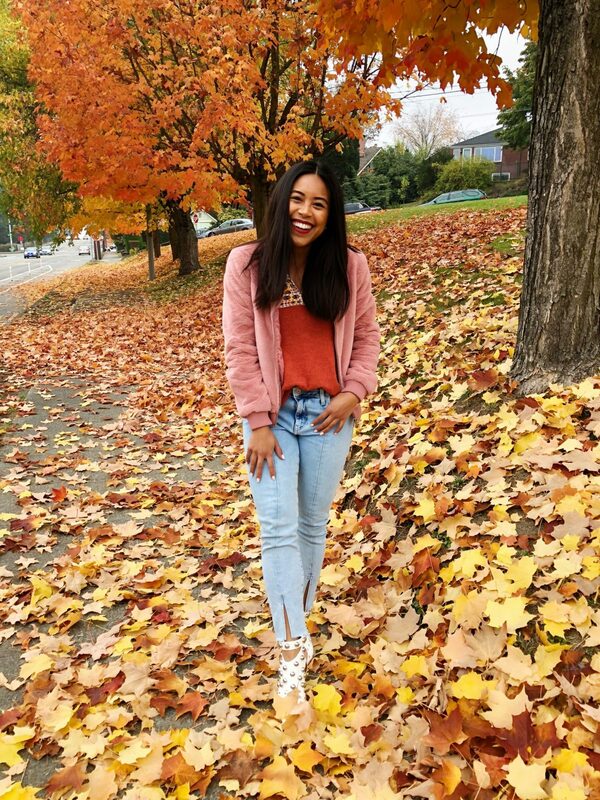 I picked up this fuzzy pink bomber jacket at the end of the winter last year and I thought it would be fun to style in trendy fall look. I styled this pink fuzzy jacket with an orange knit tank top, light wash jeans, and studded booties. 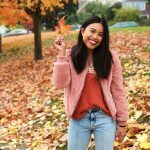 If you need a fuzzy coat or teddy jacket this fall season, I’ve rounded up 12+ fall jackets in this previous blog post. Gingham is a staple print that can be worn both in summer and in fall – depending how you style it. Even the Northwest has cooler temperatures in October and November, it’s still relatively mild outside. So I personally still try to wear dresses, especially if I know rain isn’t in the forecast. 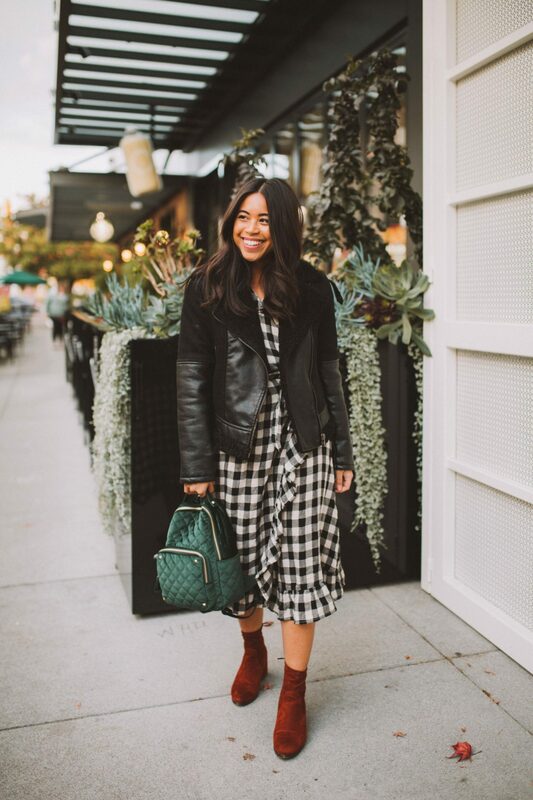 I shared this look last year and I’m sharing it again this year because I still love this gingham jacket and black moto jacket! Leopard and everything animal print is everywhere this season! I knew I needed to add a little leopard to my Molly Moon’s Homemade Ice Cream collaboration. 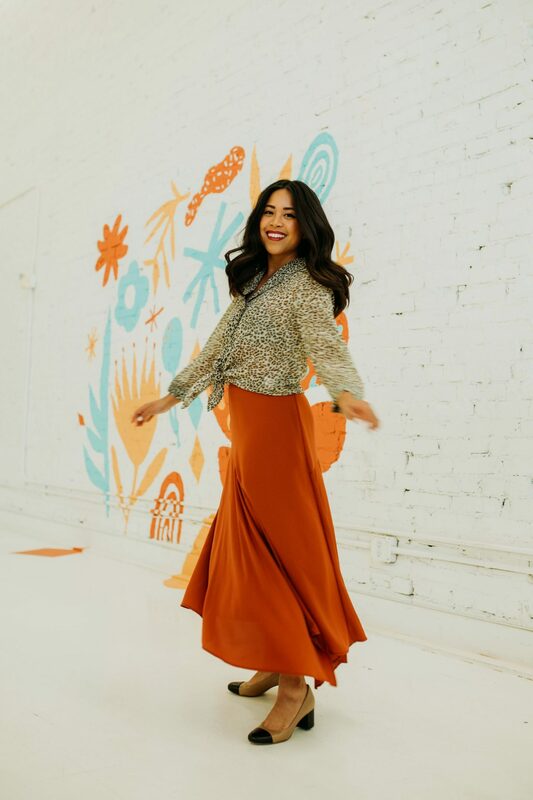 So I styled this leopard top and orange maxi skirt after being inspired by the pumpkin clove fall seasonal flavor! 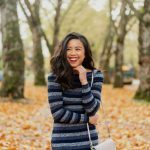 You can check out the 3 fall flavors and the 3 outfits I styled to match them in my Molly Moon’s collaboration earlier this month. 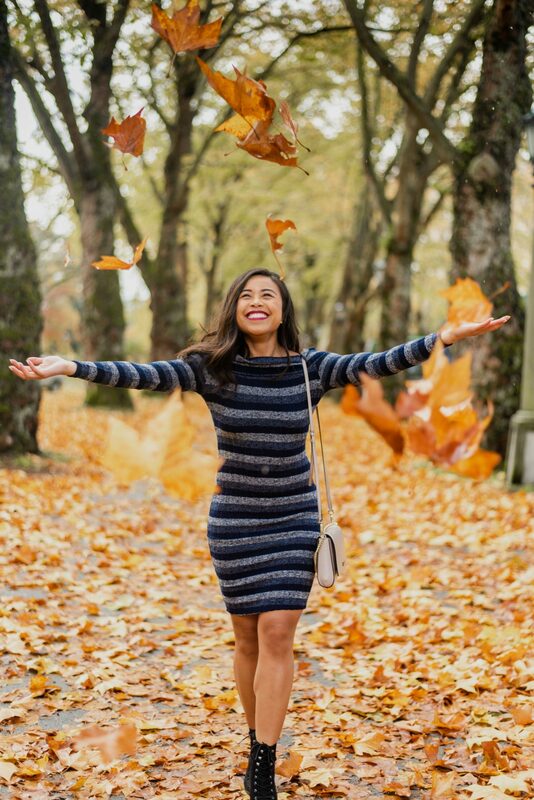 What are your favorite fall outfits or fall pieces this season? 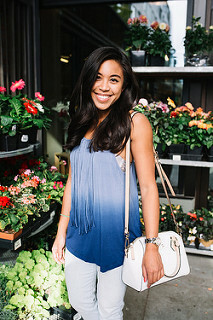 Thanks for all of the cute style inspiration, girl! You are the cutest thing 😍 Thanks for sharing EMMA! I absolutely love that striped dress – so perfect for work or even happy hour! 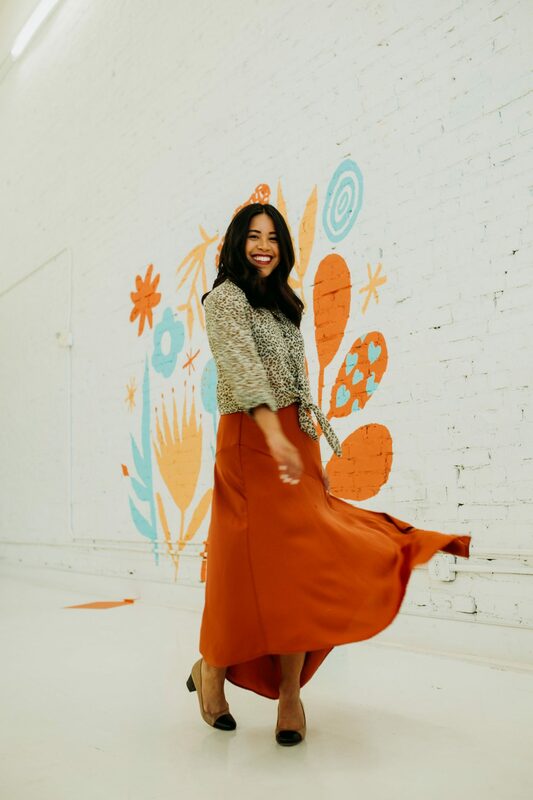 You have great style – definitely going to be following you!